Let’s get this out of the way first- City are boss and David Silva is a magician. Fortunately, we’ll only have to face him and them once more in the league this year. As Everton’s search for a ’10’ continues to rumble on, we witnessed a performance of absolute class from City’s own. It felt like the only time he gave the ball away all afternoon long was when he thundered a shot against the Park End post and it came back to Ross Barkley. The contrast between the average in game positions for the two sides is stark. Brendan Galloway who would go on to be substituted at the end of the first half with a knee injury continued at left back, with the same side that started against Southampton taking the field at Goodison just over a week later. An all too familiar problem with a lack of width can be seen ahead of Galloway, and he was left exposed a couple of times by the advanced Navas and Sagna down the City right. Note the distance between Everton’s center half pairing of John Stones and Phil Jagielka when compared with City pair Vincent Kompany and Eliaquim Mangala. While Everton do like to split their center halves like this when in possession, it is also in part due to the covering required when faced with the formidable City advanced quartet of Aguero, Silva, Sterling and Navas. In contrast, City’s two center halves only really had to worry about Lukaku and so were comfortable leaving a larger space to their fullbacks, particularly to Sagna on the right with no Everton player occupying the left flank pushing on far enough to keep Sagna from driving on to support in attack. Whilst Everton were hampered slightly by having to use a sub to Bring on Ty Browning, shunted in as an emergency left back after injury to Galloway, Roberto Martinez chose to bring on Steven Naismith before either Kevin Mirallas or Gerard Deulofeu (who had to wait until the 86th minute to find his way onto the pitch- but more on that later), despite the fact the spaces Everton were unable to exploit, particularly down the City right- seemed to be ideally suited for either winger. With Everton comfortable in possession in the opening moments, they are playing the ball around without City having to break their shape or getting too concerned. In the picture above, as the ball is worked backward, Phil Jagielka has looked over his shoulder to look to check where Brendan Galloway is behind him. He asks for more width and instructs Galloway to move wider and further forward to try to stretch the play. Just a couple of passes later and the ball is worked into the feet of Romelu Lukaku who takes a poor touch and surrenders possession to city who break. Galloway (circled) is now badly out of position having tried to push forward (because there is nobody ahead of him). As Fernandinho carries the ball, Navas scampers alongside him and is given the ball with space to work. The ball does eventually end up at the feet of Sergio Aguero who forces a smart save at the feet of Tim Howard with a low shot on the angle. From the City perspective, the ball was fortunate to come to him via a deflection, but already Everton’s shape was causing problems for ourselves. 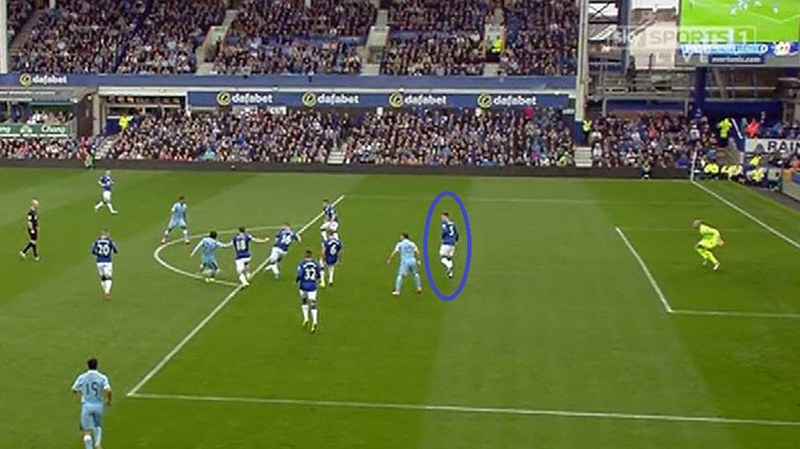 It should be noted at this point that John Stones was alone in playing Aguero onside for the chance, and whilst it didn’t cost us, it is something that should be corrected to save from it in future. Into the swing of the game and Everton have started well. Moving the ball about nicely at a decent tempo, they are managing to get around the City box without really getting in it. A deep Tom Cleverley cross sees Lukaku jump under the ball despite him having a touch of space to make his run and jump uncontested, but nothing more exciting than that. 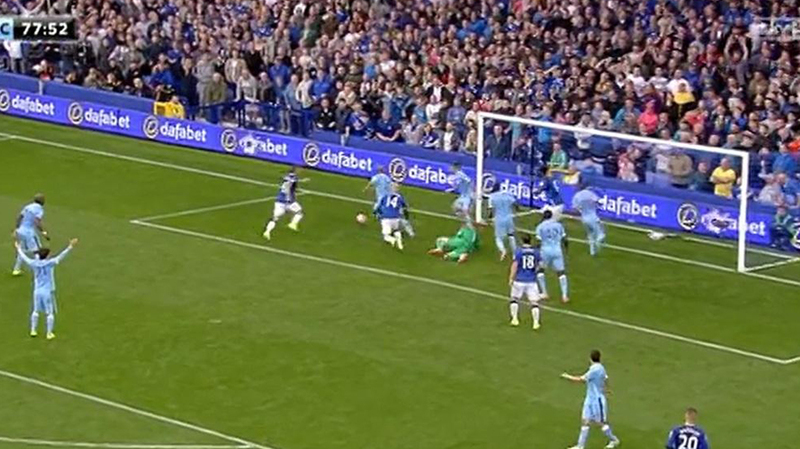 City created their next chance a couple of minutes later, and it again came down the Everton left. Galloway is being left in one on one situations with Navas, and City manage to exploit this to make another chance for Aguero. 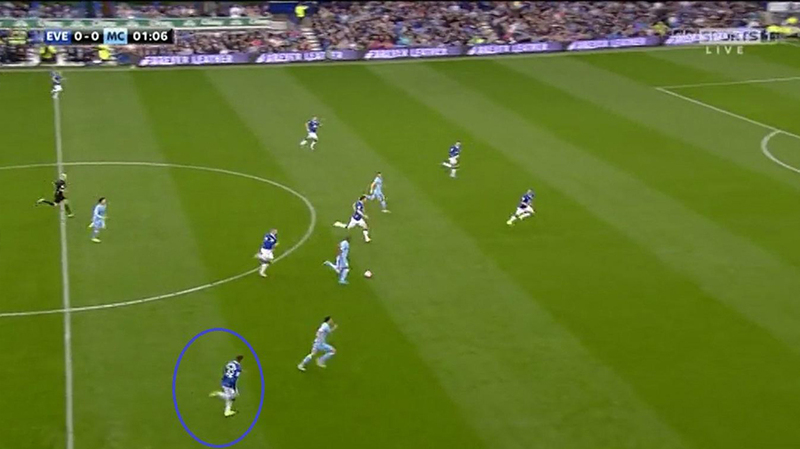 Circled is Barkley alongside Silva who swaps passes with Navas, pushing the ball into the space behind Galloway. 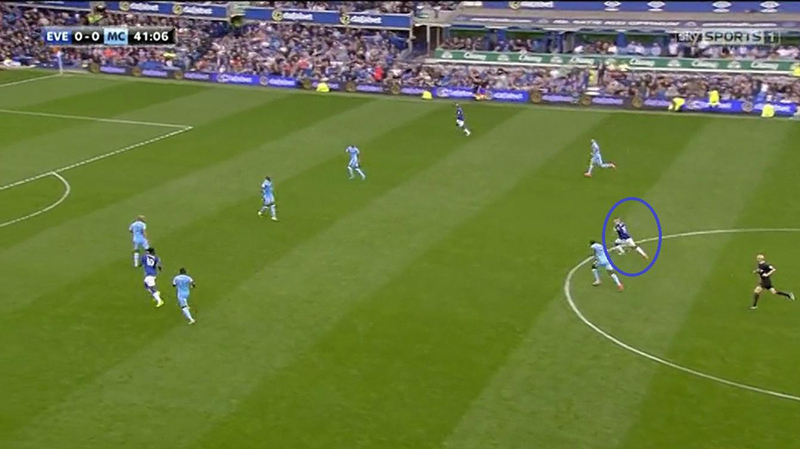 Beside Silva is Barkley who has lost sight of Silva who has managed to drift just out of his vision. Barkley is much more comfortable in deep central positions and is able to influence the game positively when in possession from these areas, but is still prone to lapses of concentration (as any young player is). Whilst last year played advanced his lapses of concentration were most notable when giving the odd ball away inexplicably cheaply trying to play a simple pass, when deeper a moment like this is liable to leave the team exposed. That being said, Barkley is facing in Silva, the best player in the league at finding spaces to hurt the opposition. Navas manages to work the ball back inside to Aguero who has managed to find space in the crowded box with his clever movement, and force another save at the feet of Tim Howard, albeit a much more routine save than his first. City were ticking by this point, constantly looking to attack down the Everton flanks. When Coleman was pushing up in attack Sterling was reluctant to follow and if he did, he wasn’t really looking to challenge him, City were playing on the break. They forced another decent chance down the Everton left when Kone who had done well to track back and intercept a City pass then had his pocket pinched as he dwelled on the ball. Silva managed to square a ball eventually across the six yard box only for Raheem Sterling to try to stretch for what would have been a tap in with his right foot rather than his left… £49 million quid, eh? Galloway was not receiving enough support from his more experienced colleagues, and City were playing on it. Gareth Barry who had done such a good job of keeping Sadio Mane so quiet in our trip to Southampton, was unable to keep the ball from finding the feet of David Silva again and again, who was the key to everything good City had to offer. Barry was actually putting himself about quite well at this point, but just wasn’t able to get to grips with the movement of the diminutive Spaniard. Alongside Barry, McCarthy was struggling to have any real impact on the game either defensively or his driving energy we are used to seeing from him- Roberto Martinez could be heard encouraging McCarthy from the touchline as City began to impose themselves as the better side in the game. Midway through the first half and Everton manage to put the ball in the net, only for it to be ruled out for offside. 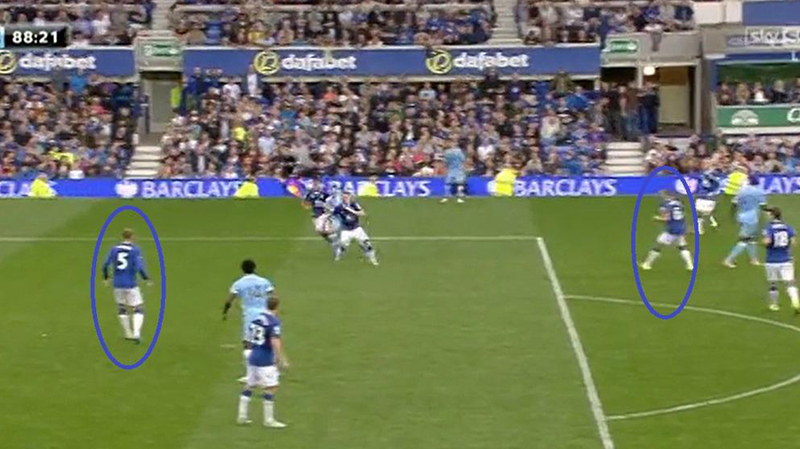 Kone turned the ball back to Barkley on the edge of the box who found Lukaku first time, his leg offside. Lukaku rounded Hart and slid the ball home, only for it to be called back. The right decision, but a close one all the same. The irony of the linesman at the other end of the pitch being the same linesman who failed to rule out Christian Benteke’s winner for Liverpool against Bournmouth will not be lost on Evertonians. Circled is Barkley who has managed to take the ball past Yaya Toure on the halfway line and accelerate towards the City goal. Toure, a player who has made a career with powerful runs from deep is simply unable to match Barkley’s athleticism, despite Barkley having to keep the ball under control, too. 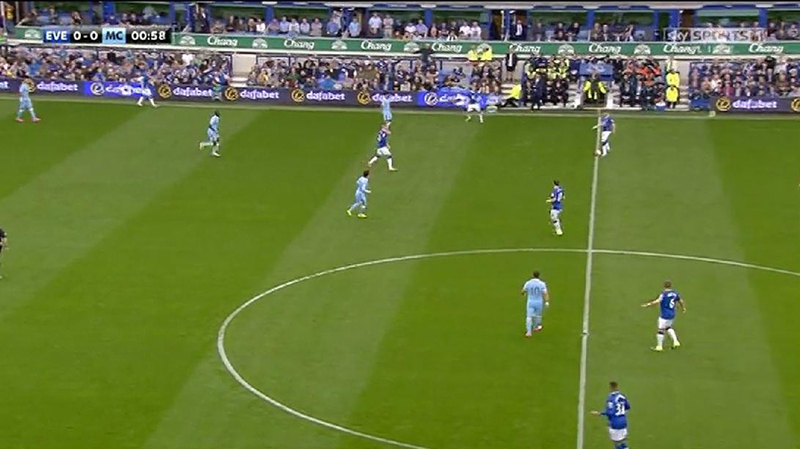 This was the first situation in the game Everton were able to get the ball into an area like this at the feet of Barkley and five minutes before half time, it is the most threatening they have been (aside from the offside goal). Mangala would trip Barkley and be booked, but unfortunately, Everton weren’t really able to muster another moment like this for the rest of the game and force Mangala to make a decision to try and tackle or stand off one of our more dynamic players- disappointing given his form has been patchy at times since his move to City. Barkley fluffed his lines from the free kick, whipping it about fifteen rows deep into the Park End. Before the half was out, the energetic Tom Cleverley was able to carry the ball at the City defence and draw a foul from Fernandinho which would lead to him joining Mangala in the book. Lukaku stood over the free kick and thundered in a side footer which grazed the City bar. England goalkeeper Joe Hart would have been helpless had the shot been on target, shifting all his weight to his left hand side anticipating Lukaku going that way, only for the Belgian to strike to his right. In a game against a side as good as City you always feel everything just has to go right for you, and Everton were unlucky to not open the scoring here. The game would drift on to half time and applause from the home crowd. 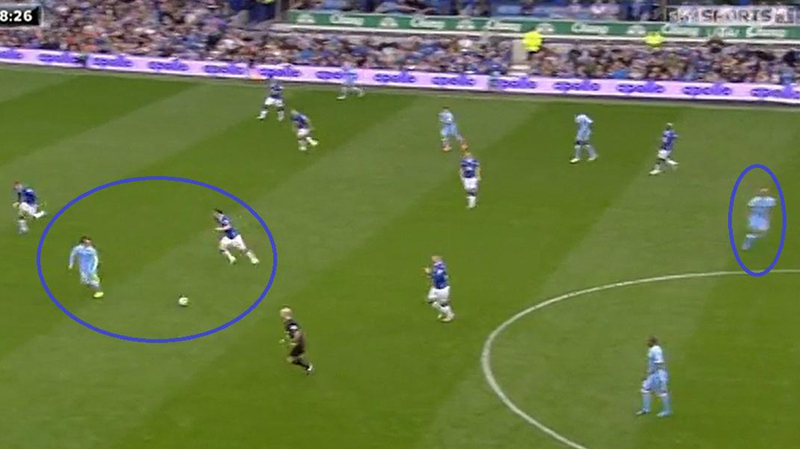 Circled to the right of the picture is Vincent Kompany who has been able to carry the ball forward unchallenged and play a simple ball into Silva who (from an Everton perspective) is the wrong side of Gareth Barry and able to turn toward goal. Silva had previously struck the post following a pass from the busy Raheem Sterling, and Everton were unable to stop him. There’s no shame in struggling to match up to Silva who finds space better than anyone, but given the supposed defensive ‘shielding’ play of Barry and McCarthy who don’t offer much in the opposition half, this shouldn’t be as easy as it was in this picture. Despite City starting the better, Everton did have a decent opportunity when a good Tom Cleverley cross passed Lukaku by. A combination of Lukaku caught on his heels and an excellent, disciplined City defensive line meant the half chance went begging. Cleverley (circled) is giving Lukaku the eyes and as Coleman loops around him, forcing Kolarov to step off Cleverley slightly, he plays an excellent ball in between defence and ‘keeper. On an afternoon starved of any decent service, Lukaku doesn’t appear to expect the quality of the delivery, despite the opportunity appearing so obvious as it took time to unfold. On another day this would have been a good chance to open the scoring- Cleverley has impressed so far since his move, winning Evertonians over with his enthusiasm and thoughtful play. Although a case can be made for him not being best suited to the position he currently occupies on the right hand side of the midfield for Everton, his delivery from wide can be very good, and Seamus Coleman’s form has started to benefit from the support he receives from the Mancunian. With Everton having weathered the City pressure at the start of the second half and gaining their footing back in the match, they then fell behind as the hour mark approached. A poor, heavy touch from James McCarthy near the City area allowed them to break with several Everton players caught out having lost the ball so cheaply. In a matter of seconds from losing the ball, Raheem Sterling had fed the ball to the overlapping Kolarov who squeezed the ball past Howard at the front post. It was a poor moment for the Everton stopper, having made a couple of decent saves up to this point. Little could be done to stop the City counter attack once we’d lost the ball, but the positioning of the ‘keeper simply wasn’t good enough for the goal. Howard would go on to make a smart save from Jesus Navas after some calamitous Everton defending had allowed him a clear run at goal. Desperate to find a pass he delayed and delayed before shooting and hitting Howard on the jaw. Probably more a case of the ball hitting Howard than it being a good save but he’s got to be there to be hit, in Howard’s defence. The ball was just never quite dropping for Everton all afternoon and on another day we may have scored again following a Tom Cleverley corner which Joe Hart failed to deal with. City would go on to score a second, not before the introduction of Gerard Deulofeu to warm applause. Martinez might have looked to bring a winger on earlier, either Deulofeu or Mirallas- given the poor cameo of Steven Naismith once he came on, Mirallas might be more likely to get game time next time around- his frustrations at not being brought on clear as he kicked a bag on his way back to the bench. Deulofeu, keen to impress on his return tried hard but had the ball bounce off him a couple of times. I question the judgment of anyone taking issue with Deulofeu’s performance, however. Back from injury without having played more than a few minutes down at Southampton, having missed much of pre-season and then desperate to make an impression with just four minutes remaining in a match Everton were losing one nil at this point, the frustration was audible and continued with some on Twitter after the game. Welcome back, Geri…. The goal was poor from an Everton point of view. James McCarthy caught flat footed as Nasri ran in behind him, Tim Howard flat footed as the ball bounced between them. The one time a star jump would have been helpful and he does his best to get out of the way of the ball. Talk about a mixed afternoon for the Everton ‘keeper. Sorely at fault for both goals. Anyway, City are a good team. Silva is a good player. There was loads between the two teams, but there wasn’t. 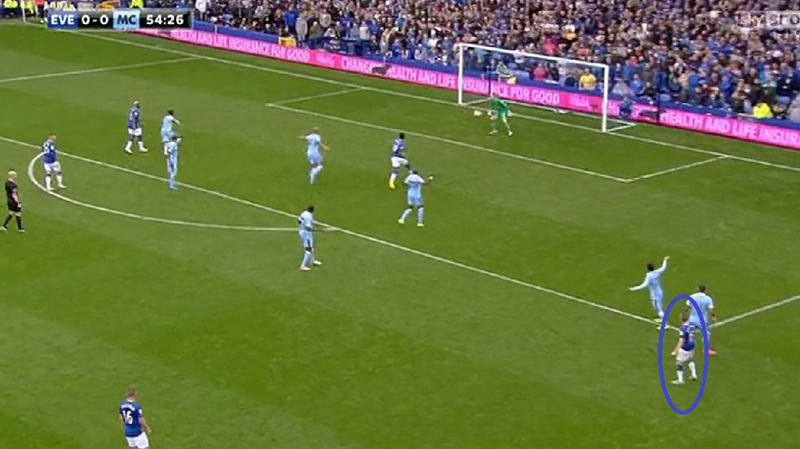 Joe Hart didn’t have enough to do, in all honesty, but City hadn’t conceded in the two games before this, either. The side that had worked so well a week before didn’t quite work out for us this time around. On another day, maybe the result would’ve been different, but it wasn’t to be. On to Spurs via Barnsley in the league cup. If we can get a 10 half as good as the City 10 we had to watch at Goodison, we’ll be a good team this year if we can keep clear of injuries. We have a good team, we just have to find some consistency and a shape that will suit. Enjoyed reading this. A much better tactical analysis than other popular toffee match reports out there. Particularly like the picture supporting evidence. The 1st ‘average positions’ graph showed everything that was wrong with the shape and tactics on Sunday. Would be interesting to see how this compared to Southampton the week before. I think the smaller size of our pitch and having no wingers nulified any counter attacking opportunity or threat. 100% agree Ross Barkley is better deep and centra but even though Martinez has said this himself at what point is goingto drop Barry to accomodate this!? Perhaps when the magic 10 does arrive? We can only hope. Well done on the fine match analysis again…I shall be be sure to drop back in for next weeks hopefully after another fine away peformance against spurs. Coyb.